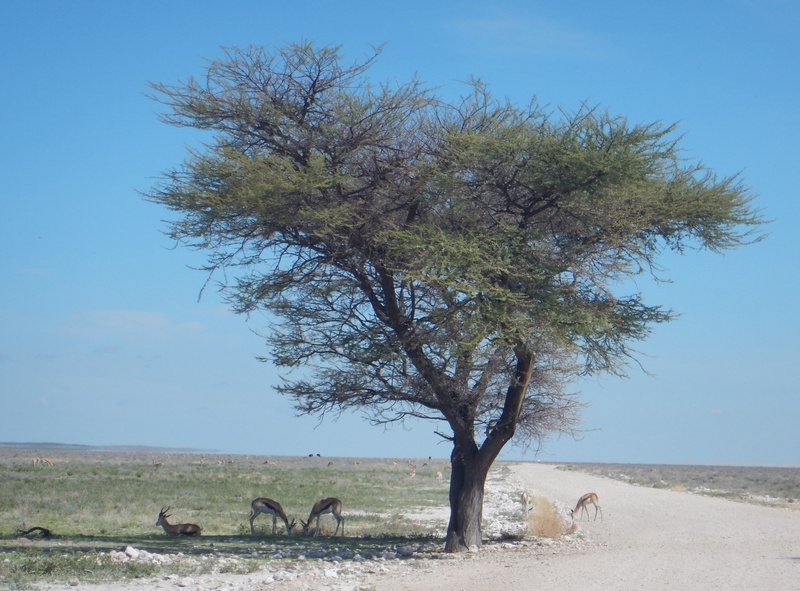 Etosha National Park is a wonderful game reserve. 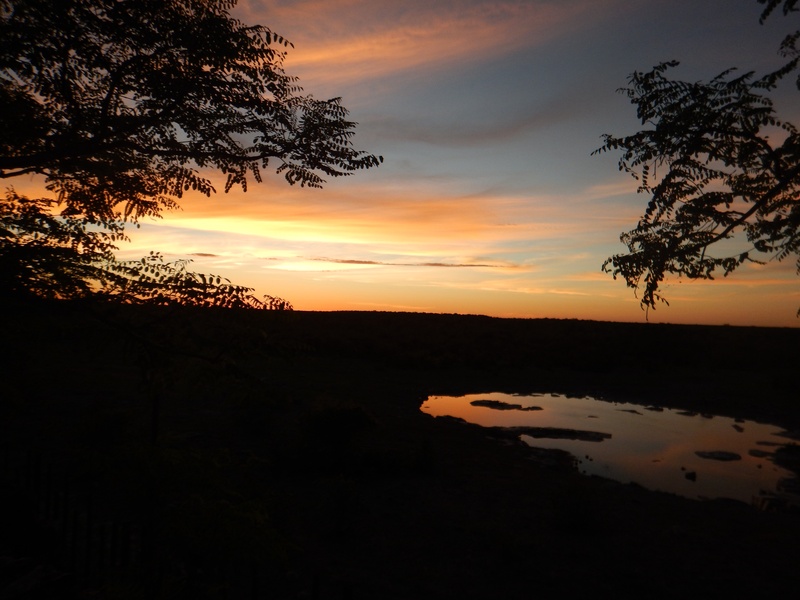 We were fortunate to spend three days and two nights here viewing the wildlife. It was not crowded one bit while we were there in the middle of December. 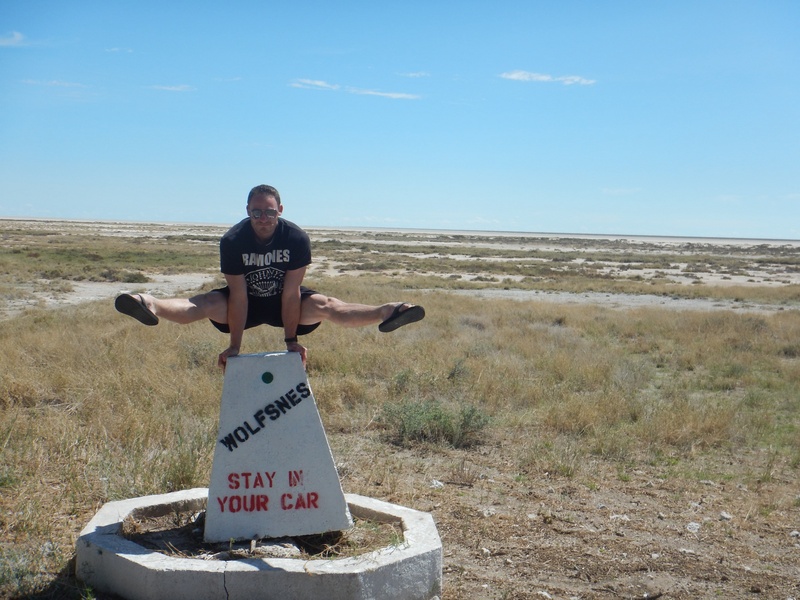 This made it very enjoyable driving and watching the wildlife. 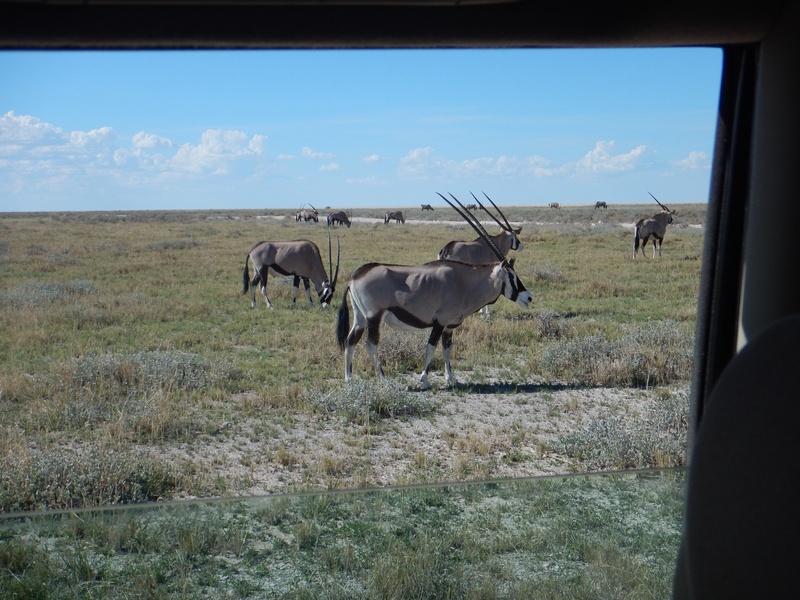 Some of the animals that we saw included impala, springbok, ostrich, giraffe, zebra, elephant, wildebeest, lion, gemsbok, and rhino. Driving our own vehicle gave us free roam of the park to see and view each place for as long as we wanted. 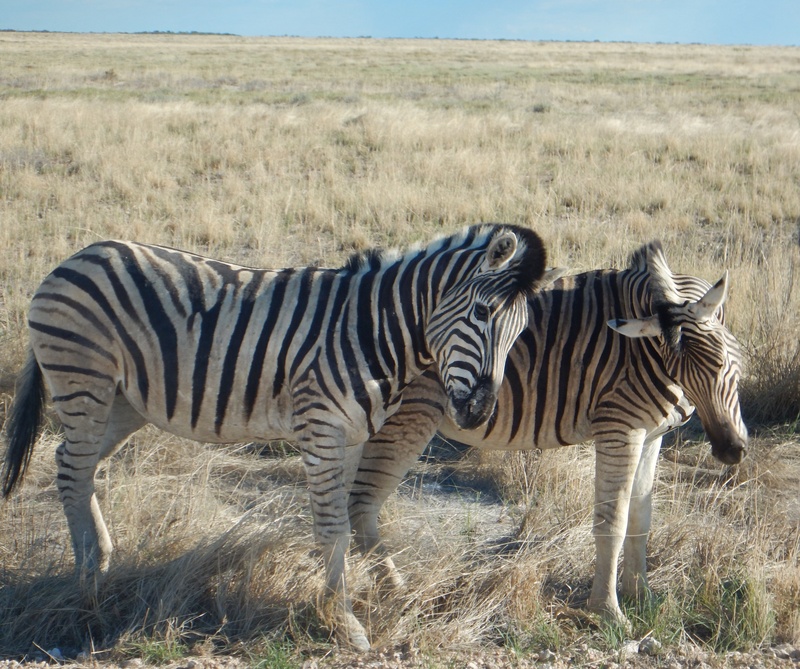 In Etosha there were a few occasions that stuck out quite a bit for me. The first happened shortly after entering the park. 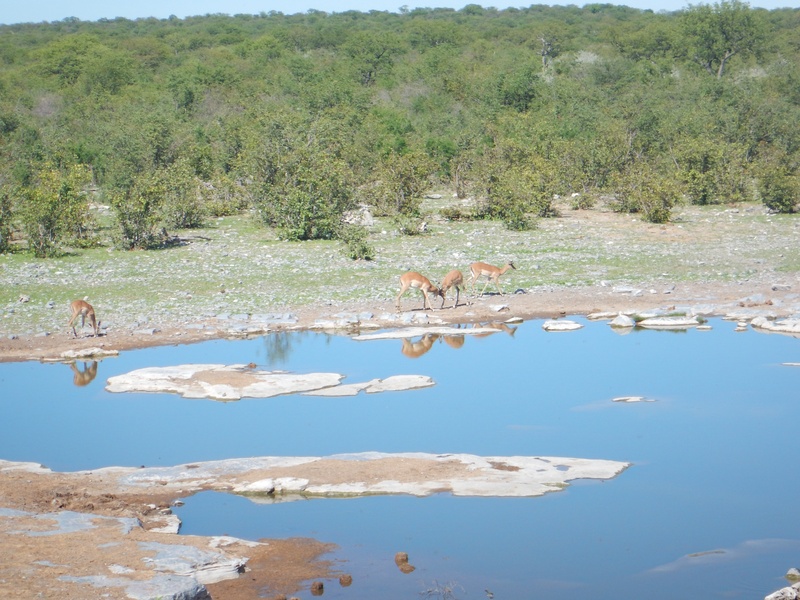 While driving down the dirt road, a watering hole was noticed and we decided to drive right up to it. 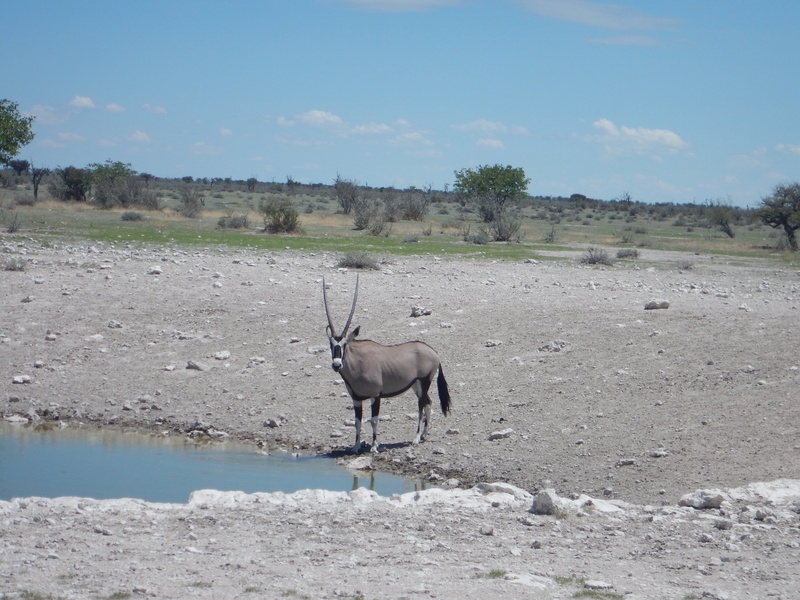 After sitting and waiting patiently, a gemsbok walked up and started quenching his thirst. The size of this animal is incredible and his horns were magnificent. 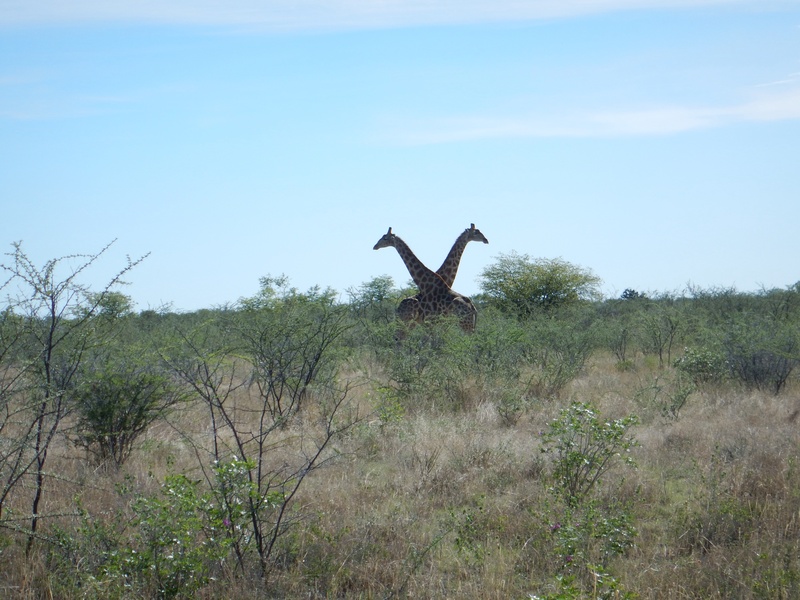 He was only 30 yards away and we made sure to stay quiet to keep from scaring him. I couldn’t believe how close he was to the car! 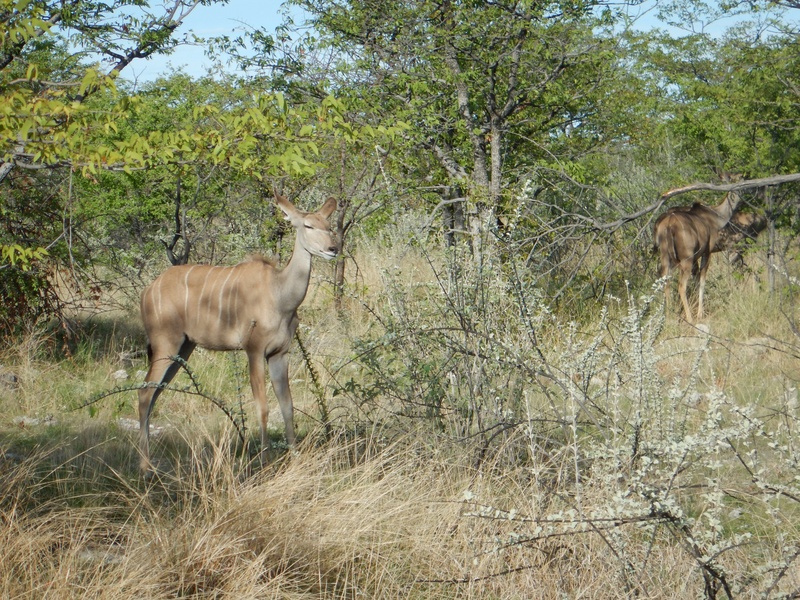 After seeing the gemsbok, a group of lions were not far away enjoying some shade under bushes. 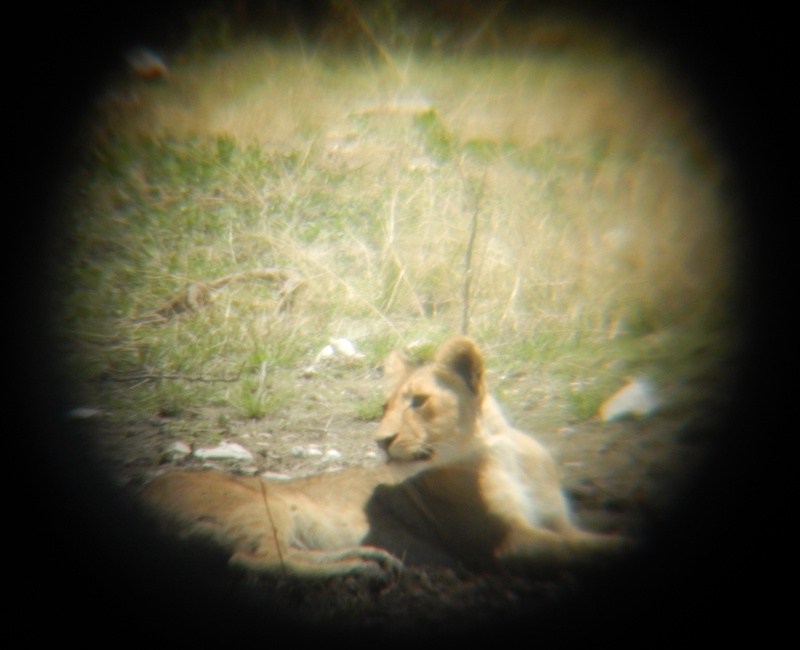 The more we sat and watched the lions, the more lions we saw! 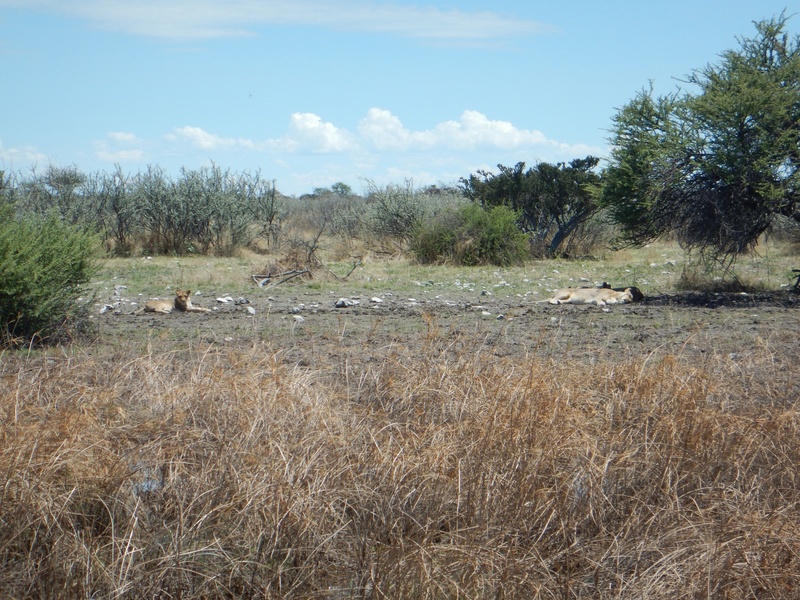 There were 8 lions here and one was a male, the first male I have seen in the wild. The other lions were females and cubs. Lions sure are lazy and ended up laying in the same spot all day long. The second day, we were driving and passed by a small road. 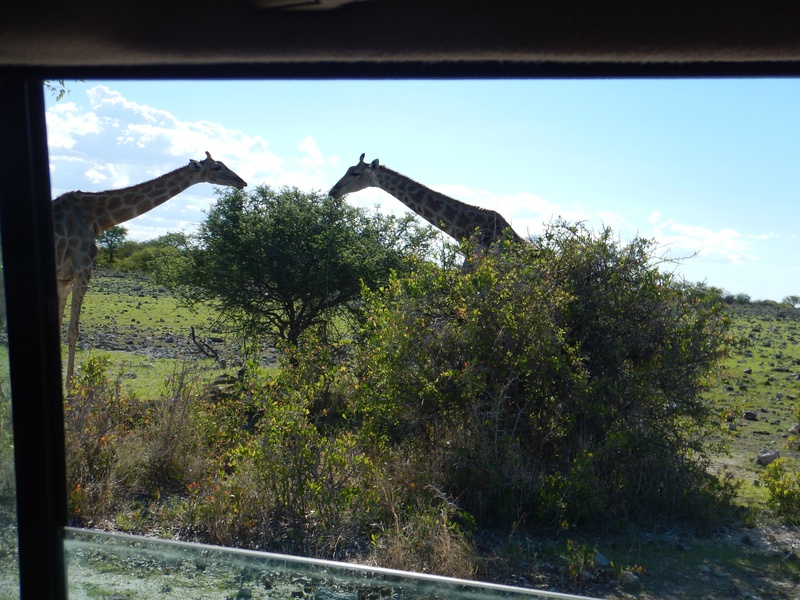 I noticed a giraffe eating food and we backed up to watch. 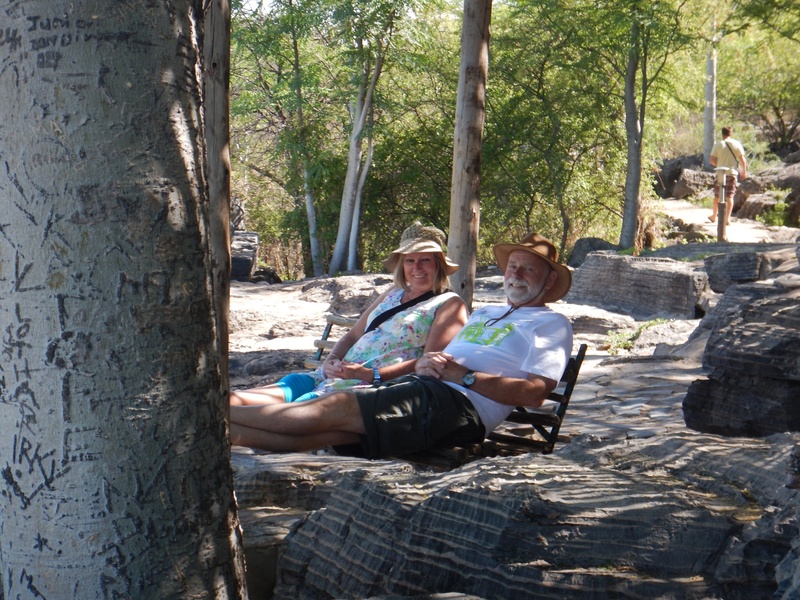 As we sat there, it noticed us and out of curiosity slowly started walking our way. Being patient each of us were curious to see how close the giraffe would come to the vehicle. 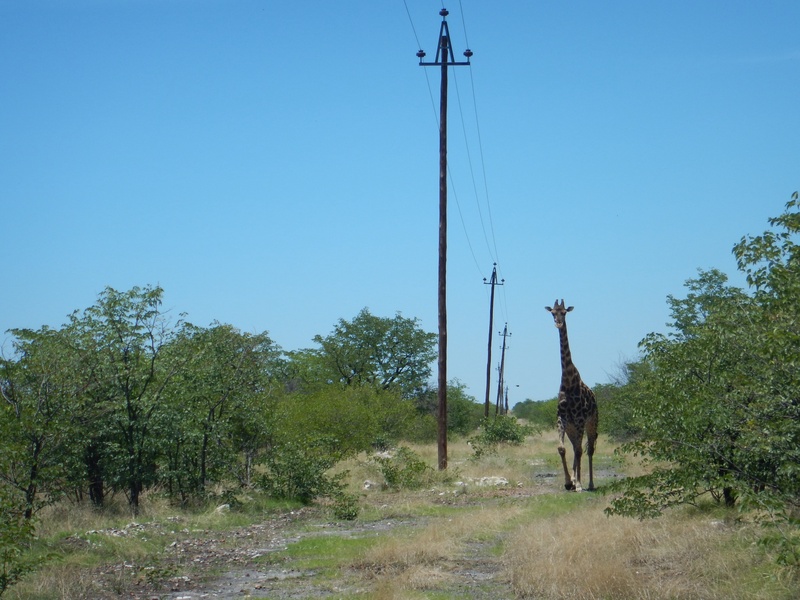 After about half an hour, the giraffe lost interest and wondered off. He ended up coming within 20 yards of the car. 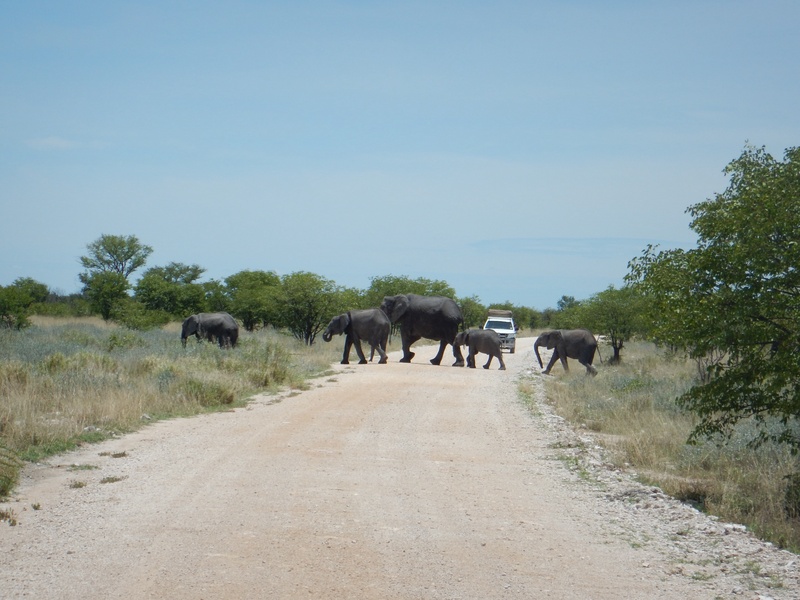 As we continued to drive down the dirt road, we stumbled upon a heard of elephants. 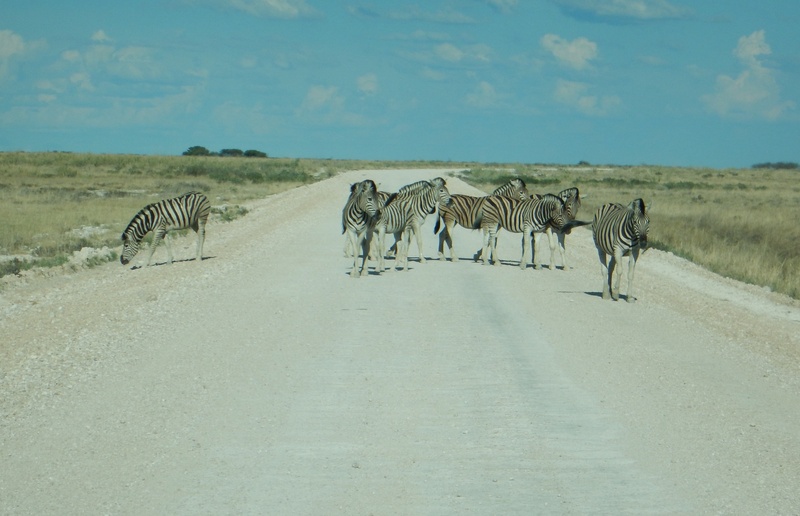 They were moving slowly and it looked like they would walk right across the road. Creeping forward slowly, we parked at the edge of a small clearing and waited. Watching the elephants make their way was incredible. It was a herd of 12 and included young and old alike. 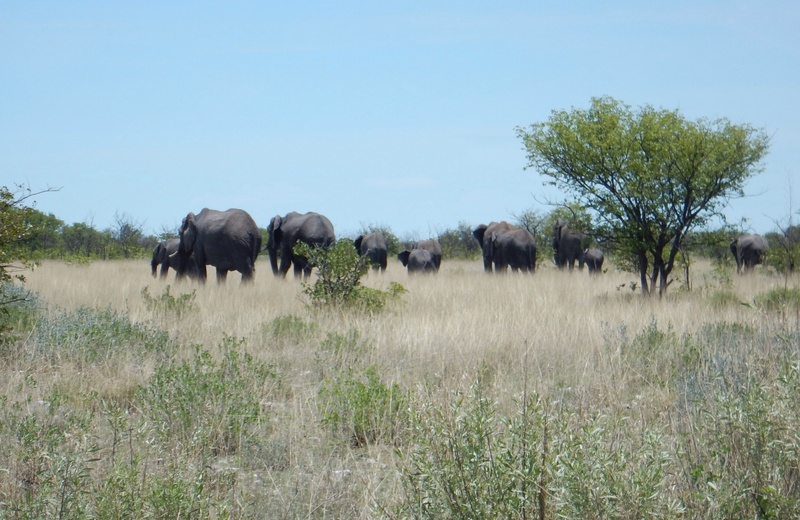 I couldn’t believe how close we were to them and the enormous size of elephants is just breath taking. 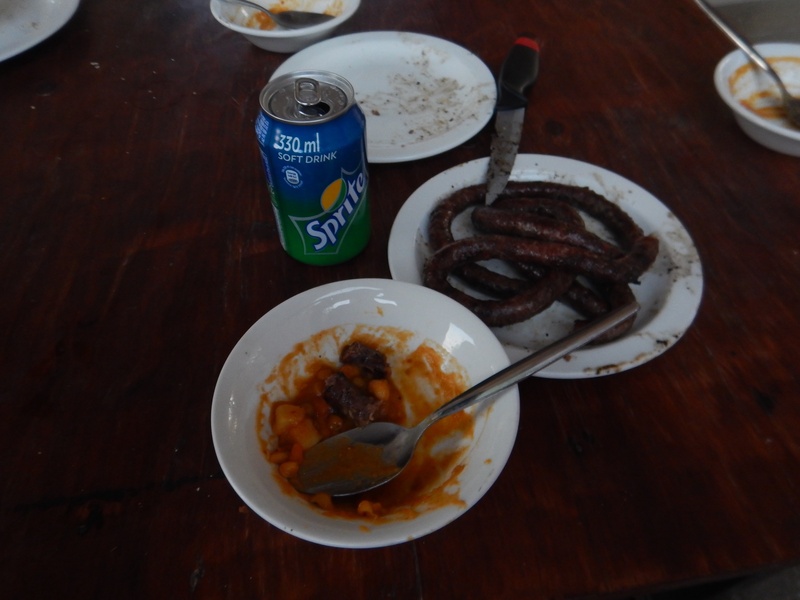 Arriving back at camp, we set up the braai to make some delicious food. 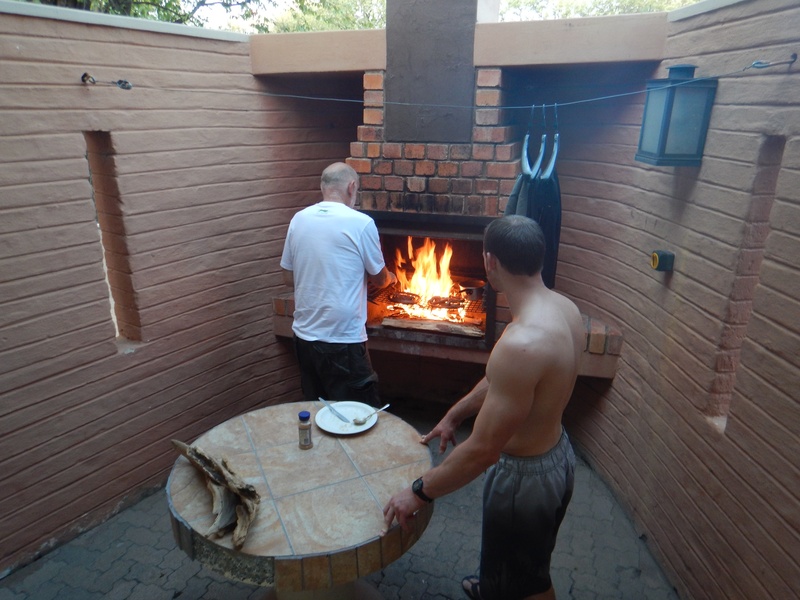 Since it was taking too long for the food to cook, Allan added some wood to the charcoal and it went up in flames. This definitely helped to cook the food faster! 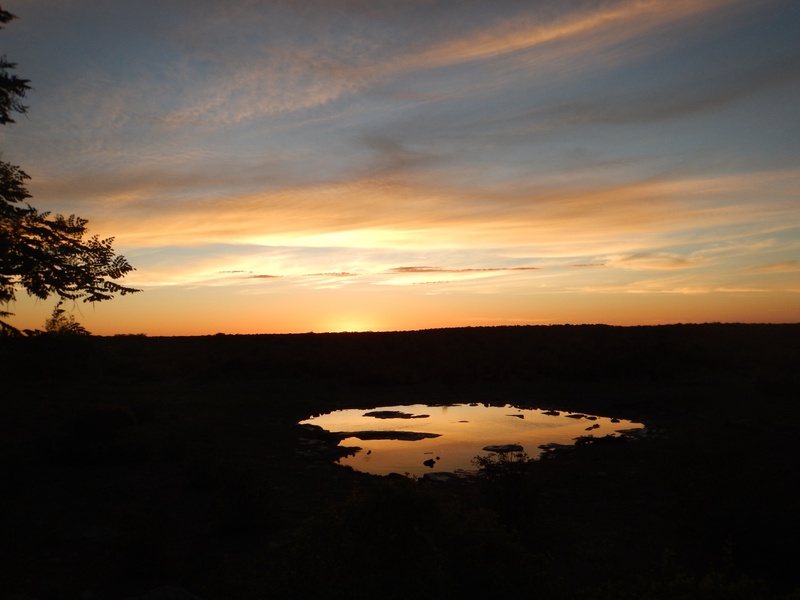 We were in a hurry because the sun was going down and we wanted to make it to the watering hole for sunset. Boy was it beautiful! 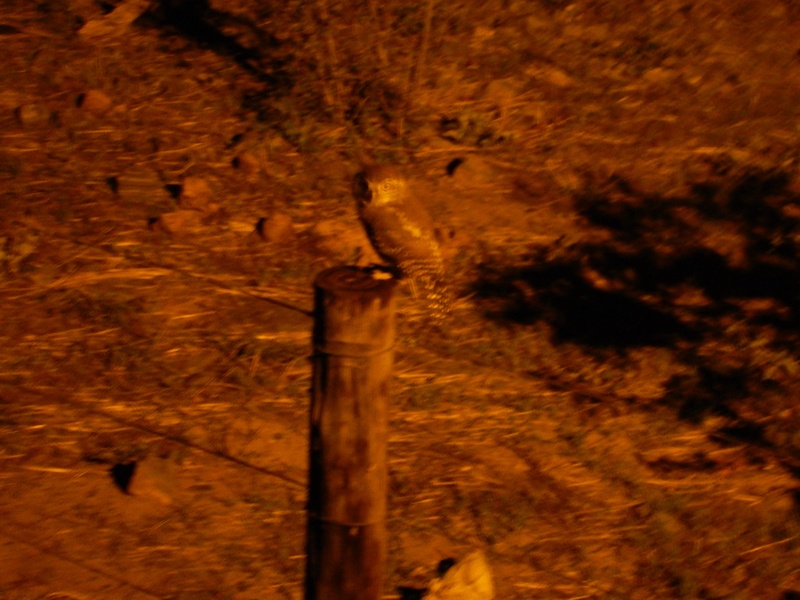 The sunset was fabulous and we even ended up seeing a small owl sitting on one of the fence posts. 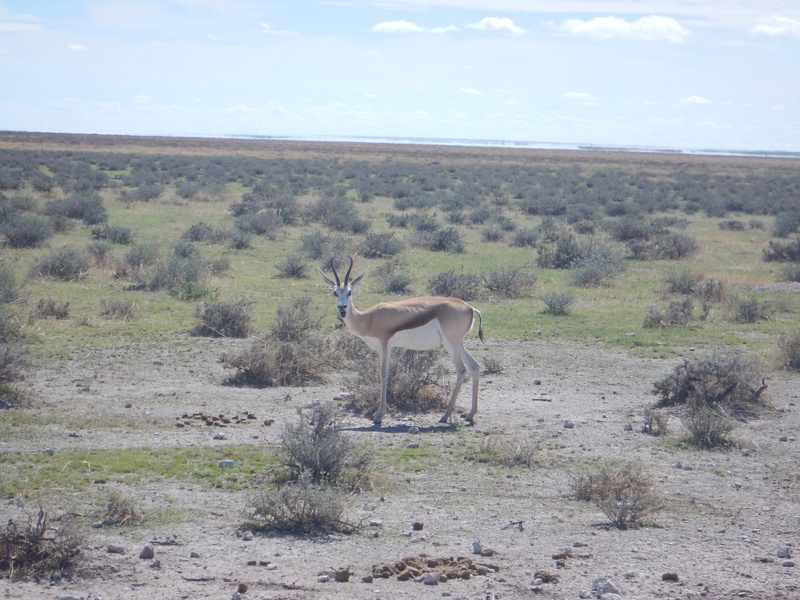 The final day came in the park and before driving out, we headed to the Etosha pan. 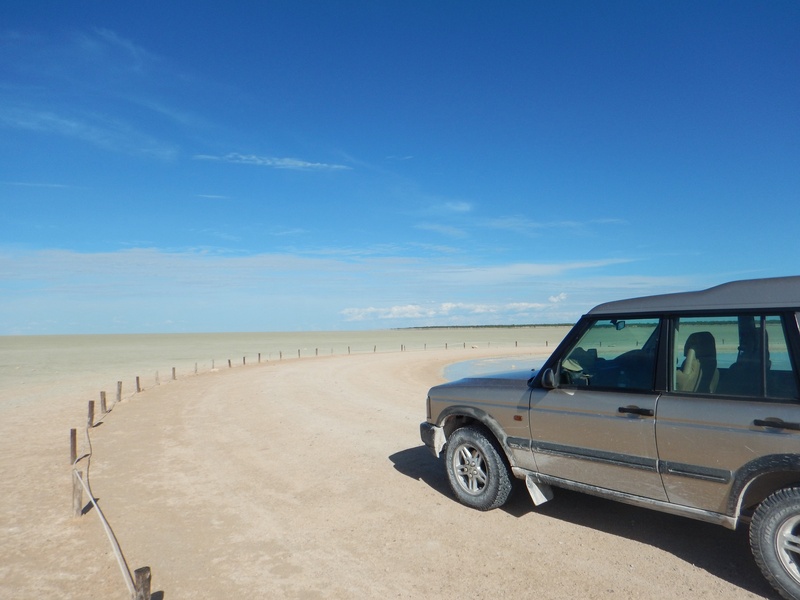 This is a ginormous salt pan that sits in the middle of the park and is 130km (81mi) long and 50km (31mi) wide. 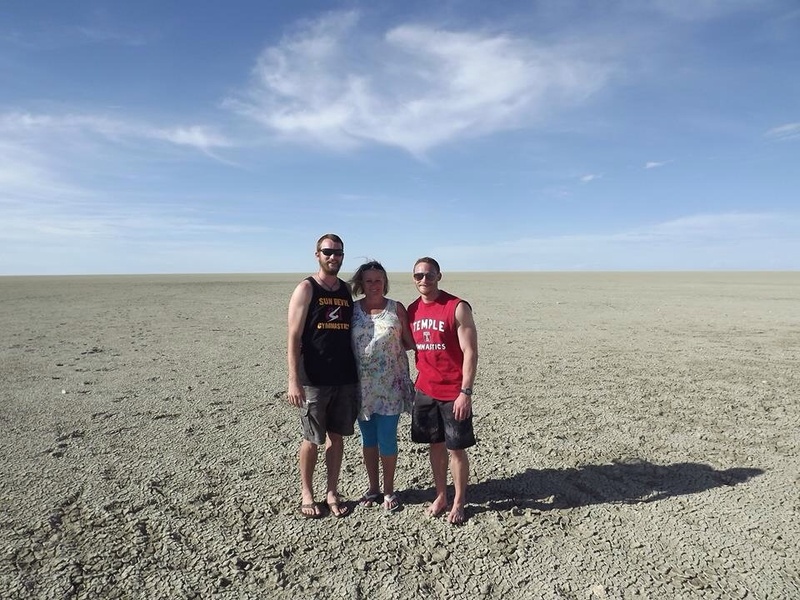 It is just a wide open area of nothingness. 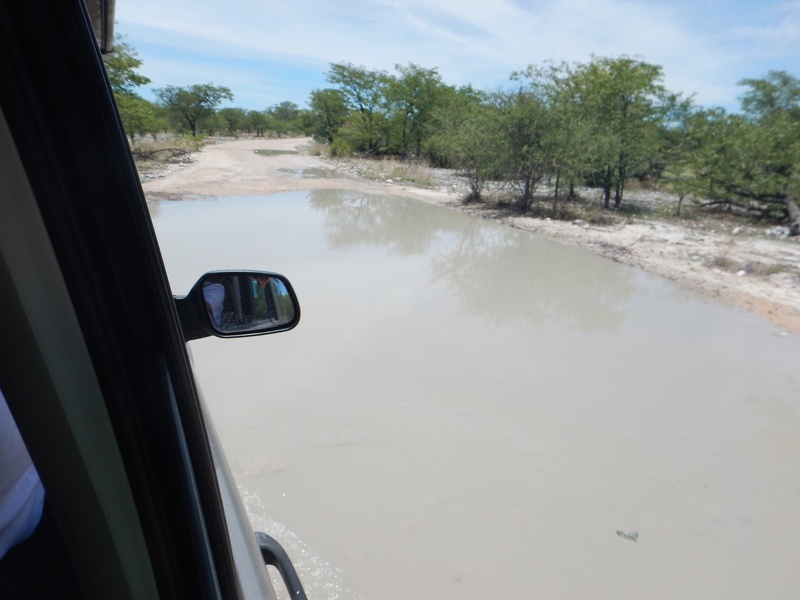 Driving into the Etosha Pan was competency different from anything that we had viewed this whole trip inside the game park. It was completely flat with a thin hardened crust over the mud underneath. After viewing the pan, it was time to head out of the park. 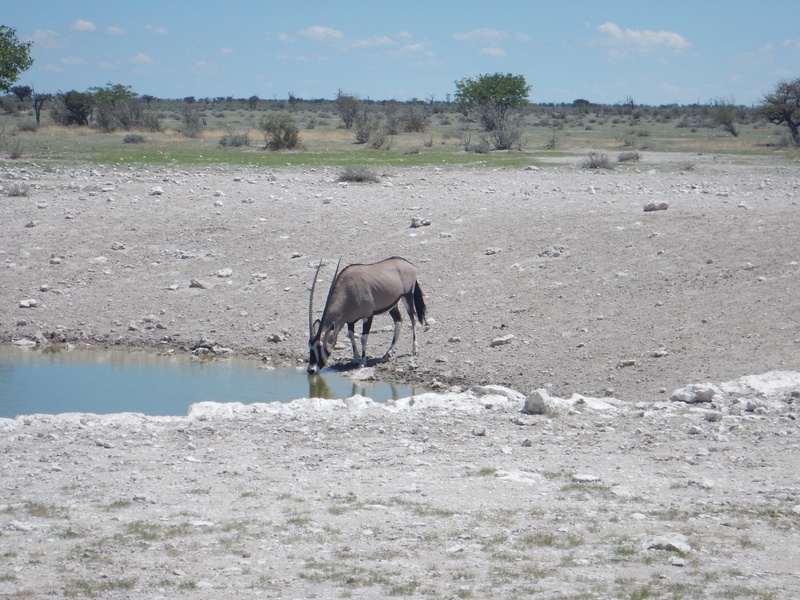 What a fantastic time inside Etosha National Park. It has been one of my favorite parks so far because it was uncrowded and the wildlife was excellent.